London duo Ten Fé are joined by a band as they tour on the back of the release – at the beginning of February – of their debut album Hit The Light. 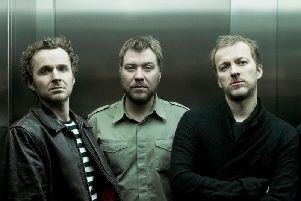 They play Brighton’s Green Door Store on March 8. The core of the band is Ben Moorhouse and Leo Duncan. “We are based in London, but a lot of the band is from Birmingham,” says Ben. “We are now a five-piece. We have got a drummer, a bass player and synth. To start with, it was just me and Leon. We started writing as a duo, and we built the tracks up on a laptop. I was at music college, and I knew some people from Birmingham. There was a guy that was at music college who was a musician. He had a bunch of mates. One night at a party, Leo was there. People were jamming, and we were both playing an old Elvis Presley song. That’s how we became friends. “We started meeting up and playing songs by people like Elvis, The Beatles, The Rolling Stones, bashing out the tunes to earn a bit of money. For a long time before we started writing together, we were playing these old songs that we liked, and we continue to play them. They are just great songs. As for the music, Leo says: “I would say that the songs are based around songs, rather than styles. It is based around the music that we are drawn to. As for making the debut album a success, Leo says: “We will do all the things that we can to. I think the most important thing for us is to play live. As long as we keep doing that, people will see how good we are. “But we are very proud of the recording as well. But the main thing is that we get out there. The tour is going to go all the way through Europe and the UK, and then after that it looks like we will be going to the States.